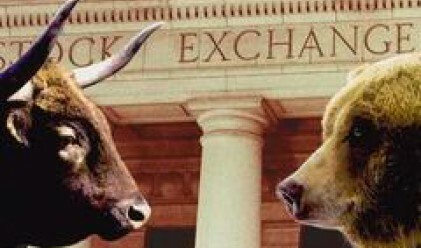 The SOFIX blue-chip index of the Bulgarian Stock Exchange (BSE) ended 0.79% lower at 1348.94 points on Monday marking its fifth consecutive session of losses. The index has shed 5.64% of its value since the beginning of the month, Profit.bg data show. BSE's three other indexes also ended Monday's session in negative territory. The broader BG40 index declined by 2.72% to 376.91 points, while the BGTR30 and BGREIT indexes closed 1.38 and 1.43% lower at 861.69 and 98.67 points, respectively. BSE's total trading turnover amounted to 6.527 mln leva on Monday, while the number of traded positions stood at 137. Industrial Holding Bulgaria closed 0.78% higher at an average of 7.80 leva per share to become SOFIX's only gainer on the day. Sopharma's stock price remained unchanged, while the remaining 14 companies within the index ended lower. Orgachim's stock price went up by over 5.5% to 434.11 leva per share, while Chimimport and M+S Hydraulic lost 2.86% and 2.03% to 10.19 and 10.53 leva per share, respectively. The declines swept through the banking sector as well. First Investment Bank closed 2.61% down at 9.34 leva per share, while Corporate Commercial Bank's stock depreciated by 0.73% to 90.24 leva per share. Central Cooperative Bank and Bulgarian American Credit Bank lost 0.44 and 0.22% of their value to 6.70 and 72.00 leva per share, respectively. Road construction companies also closed Monday's session with losses. Trace Group Hold's stock shed 6.17% of its value closing at 144.42 leva per share. Holding Roads' stock depreciated by 1.77% to 1151.98 leva per share. Industrial Holding Bulgaria advanced by 0.78% to 7.80 leva per share, while Synergon Holding closed 0.86% higher at 10.61 leva per share. Svercoop Gamza Holding's stock price went 1.32% up to 3.85 leva per share.